The circuses were given 12 months to relocate their animals, but there are still around 40 animals with the circuses including tigers, lions, monkeys and pumas. Animal Defenders International (ADI) is working with the authorities to enforce the law and save the animals. Please help us get the animals, and look after them until they go to their forever homes. For the lions, this will be the new sanctuary ADI is building in South Africa, the natural homeland of many wild animals used in circuses. A number of US sanctuaries have offered permanent homes for the tigers. It will take many months to remove the animals from the circuses and complete the paperwork needed to get them home. We need your help to fund construction of holding units for the animals and for their food, veterinary treatment and more. Please help make history and empty Guatemala of its circus animals, ending the suffering forever! 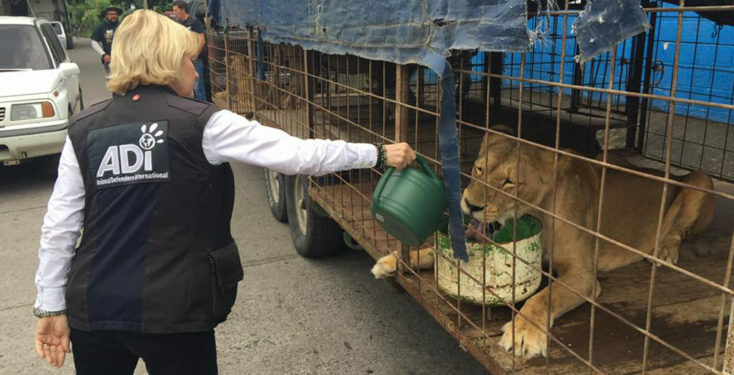 ADI has a team in Guatemala helping enforce the ban on animals in circuses. We have removed nine tigers and six lions from circuses and they are in our care at the ADI Temporary Custody Center. This page has further updates. To get the latest news from Guatemala delivered straight to your inbox, sign up to ADI’s email list today!